Until relatively recently in human history, books and documents were valued both for their contents and for the prodigious effort involved in their creation. 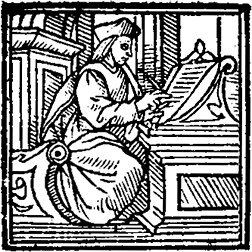 Book production in a pre-computer age required a high level of literacy, as well as many hours of monotonous labor, whether that of a stoneworker, metal engraver, scribe or printer’s devil. It was the custom in some cultures to protect precious works by whatever means available: many medieval libraries chained books their shelves to prevent theft,** private collectors might keep their most valued books in locked chests. Especially rare, illustrated tomes might be bound with their own locking clasps to prevent sticky fingers from helping themselves to a page or two. An additional layer of protection was afforded by the book curse. There are examples of book curses appended to written records from ancient times. They flourished in medieval Europe where scribes, typically monks, were eager to protect the product of their labor. And they can still be found today! The above is taken from the definitive work on book curses: Anathema – Medieval Scribes and the History of Book Curses (Allanheld & Schram, 1983), by Marc Drogin. Drogin finds additional examples from classical Greece, written on parchment. But he devotes the bulk of his study to medieval book curses. On this subject, Drogin goes to some length to explain how books were made in the era of monastic scribes, illuminated manuscripts, and parchment. With all the resources required to create a single volume, it is no wonder the scribes and their masters were inclined to take drastic measures to protect them. Book curses appeared frequently, generally on the first or last page of a volume as part of the colophon. Being of a religious bent, these men (and some women) tended to call down the wrath of God on miscreants. Whether in good Church Latin or in the vernacular of the land, medieval scribes did not hesitate to execrate! Once Gutenberg’s printing press and its descendants got rolling, books and copies of books became more readily available. Still, the work of setting up type, incising illustrations into metal plates, and manually “pulling” sheet after sheet of paper off a wooden press was no mean feat. Book collectors still sought to protect their acquisitions; by no coincidence, about this time hand-written book curses evolved into printed bookplates. Or it may be a more original and ornate design incorporating heraldry, block prints, whimsy, and printed or hand-tinted color. Note that the second book plate above subtly references the Necronomican, H.P. Lovecraft’s “dreaded volume.” The Necronomicon is a cursed book in the sense that anyone who messes with it is pretty much guaranteed to get into trouble. While a book curse offers protection against theft, a cursed book brings calamity to anyone who dares open it. * Quoted in Drogin, p. 71. *** Quoted in Drogin, p. 53. + Quoted in Drogin, p. 72. ++ Quoted in Drogin, p. 78. ABM Guest Blogger Eleanor Boba is a public historian who blogs about historic places off the beaten path and other curious matters. She lives in Seattle.